R&S also offers economical roll up curtain doors, mullions and header panels for self-storage applications. 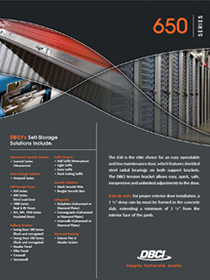 Whether it new construction or replacement R&S is able to meet the need for secure, effective, space saving closures while providing outstanding economy and value. Color options are available. 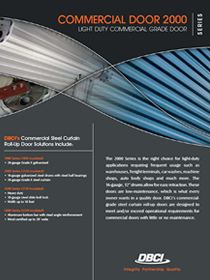 Contact us today to have a free on site evaluation of your roll upcurtain doors. Quick-Connect bracket assembly for fast installation. Slide lock is bolt mounted for dual padlock capacity for security. Hot dipped galvanized steel with high temperature baked enamel finish. 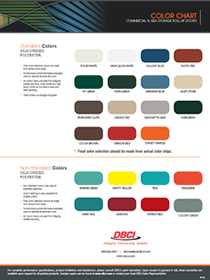 DBCi is one of the top manufacturers of steel curtain roll-up doors and components for the self-storage and commercial door markets. Multiple options are available to suit your roll up curtain door needs. Rain lip note: For proper exterior door installation, a 11/2″ deep rain lip must be formed in the concrete slab, extending a minimum of 31/2″ from the interior face of the jamb. Stainless steel latch. 2 padlock style, cylinder style, or with the new cast zinc Apex latch. All latches accept double locks and 7/16″ shackles. bearings for smooth operation. Worm gear adjusting design allows unlimited adjusting positions. The roll-up frame is a non-load bearing interior hallway jamb for attaching DBCi roll-up doors. The strong, flush 20-gauge frame is used in both corrugated and flush hallway systems and is available in glossy white or Galvalume. Includes base plates, back plates and top channel. The flush header panel attractively closes the gap between the top of the roll up door and the top of the hallway system. The flush header panel with roll up frames creates a clean flush hallway. The flush glossy white header panel reflects light that provides a brighter interior. Filler panels are an economical way to close the gap between the top of the opening and the roof. Filler panels are used in interior and exterior applications. The painted 26-gauge panels match the corrugation of the door. Panels are framed in at the sides, top and bottom with matching support channels and angles can be manufactured to match the color of the rollup door or contrasting color.